WARNING: Infrequently, dantrolene may cause very serious (possibly fatal) liver problems. The risk is greater if you use high doses of dantrolene (over 400-800 milligrams per day), or are female, older than 35 years, or taking other medications. Signs of liver problems usually appear between 3-12 months of treatment. To reduce your risk of this side effect, you should have regular liver tests checked by your doctor. Tell your doctor immediately if you develop any of the following symptoms of liver disease: persistent nausea/vomiting, stomach/abdominal pain, dark urine, yellowing eyes/skin, unusual tiredness. To further reduce your risk of side effects, do not increase your dose or take it more often or for longer than prescribed. The lowest effective dose should be used. The manufacturer recommends that if your condition does not improve after 45 days of treatment, your doctor must be notified and dantrolene should be stopped. USES: This medication is used to treat muscle tightness and cramping (spasms) caused by certain nerve disorders such as spinal cord injury, stroke, cerebral palsy, and multiple sclerosis. It works by relaxing the muscles. 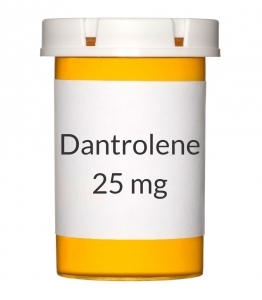 Dantrolene helps reduce muscle pain and stiffness, improves your ability to move around, and lets you do more of your daily activities. Dantrolene is also used with other treatments to prevent or treat special cases of high fever (malignant hyperthermia) related to anesthesia and surgery. OTHER USES: This section contains uses of this drug that are not listed in the approved professional labeling for the drug but that may be prescribed by your health care professional. Use this drug for a condition that is listed in this section only if it has been so prescribed by your health care professional. This drug may also be used to treat a certain uncommon condition (neuroleptic malignant syndrome) involving muscle stiffness, fever, and fast heartbeat caused by psychiatric medications. HOW TO USE: See also Warning section. Take this medication by mouth as directed by your doctor. For the treatment of long-term muscle tightness/spasms, your doctor may slowly increase your dose to lower your chance of side effects until the right dose for you is determined. The manufacturer recommends that you do not take more than 400 milligrams per day. Dosage is based on your medical condition, response to therapy, and in some cases weight. For the prevention and treatment of malignant hyperthermia, treatment lasts for several days. Take this medication regularly to get the most benefit from it. To help you remember, take it at the same times each day. SIDE EFFECTS: See also Warning section. Drowsiness, dizziness, weakness, tiredness, nausea, and diarrhea may occur as your body adjusts to this medication and usually lessen after several days. Headache, constipation, slurred speech, and drooling may also occur. If any of these effects persist or worsen, tell your doctor or pharmacist promptly. Remember that your doctor has prescribed this medication because he or she has judged that the benefit to you is greater than the risk of side effects. Many people using this medication do not have serious side effects. Tell your doctor immediately if any of these unlikely but serious side effects occur: sunburn (sun sensitivity), vision changes, black/tarry stools, vomit that looks like coffee grounds, mental/mood changes, trouble swallowing, problems with urination, severe/persistent constipation, seizures, fast heartbeat. Tell your doctor immediately if any of these rare but very serious side effects occur: easy bruising/bleeding, signs of infection (such as fever, chills, persistent sore throat), chest pain, swelling of the ankles/feet, trouble breathing. A very serious allergic reaction to this drug is rare. However, seek immediate medical attention if you notice any symptoms of a serious allergic reaction, including: rash, itching/swelling (especially of the face/tongue/throat), severe dizziness, trouble breathing. This is not a complete list of possible side effects. If you notice other effects not listed above, contact your doctor or pharmacist. In the US - Call your doctor for medical advice about side effects. You may report side effects to FDA at 1-800-FDA-1088. In Canada - Call your doctor for medical advice about side effects. You may report side effects to Health Canada at 1-866-234-2345. PRECAUTIONS: Before taking dantrolene, tell your doctor or pharmacist if you are allergic to it; or if you have any other allergies. This product may contain inactive ingredients, which can cause allergic reactions or other problems. Talk to your pharmacist for more details. Before using this medication, tell your doctor or pharmacist your medical history, especially of: liver problems (such as hepatitis, cirrhosis), breathing problems (such as chronic obstructive pulmonary disease-COPD), heart problems. This drug may make you dizzy or drowsy. Do not drive, use machinery, or do any activity that requires alertness until you are sure you can perform such activities safely. Limit alcoholic beverages. This medication may make you more sensitive to the sun. Avoid prolonged sun exposure, tanning booths, and sunlamps. Use a sunscreen and wear protective clothing when outdoors. Before having surgery, tell your doctors or dentist about all the products you use (including prescription drugs, nonprescription drugs, and herbal products). During pregnancy, this medication should be used only when clearly needed. Discuss the risks and benefits with your doctor. This drug passes into breast milk and could have undesirable effects on a nursing infant. Therefore, breast-feeding is not recommended while using this drug. Consult your doctor before breast-feeding. DRUG INTERACTIONS: Drug interactions may change how your medications work or increase your risk for serious side effects. This document does not contain all possible drug interactions. Keep a list of all the products you use (including prescription/nonprescription drugs and herbal products) and share it with your doctor and pharmacist. Do not start, stop, or change the dosage of any medicines without your doctor's approval. Tell your doctor or pharmacist if you are taking other products that cause drowsiness including alcohol, antihistamines (such as cetirizine, diphenhydramine), drugs for sleep or anxiety (such as alprazolam, diazepam, zolpidem), other muscle relaxants, and narcotic pain relievers (such as codeine). Check the labels on all your medicines (such as allergy or cough-and-cold products) because they may contain ingredients that cause drowsiness. Ask your pharmacist about using those products safely. OVERDOSE: If overdose is suspected, contact your local poison control center or emergency room immediately. US residents should call the US National Poison Hotline at 1-800-222-1222. Canada residents should call a provincial poison control center. Symptoms of overdose may include: severe muscle weakness, severe tiredness, severe drowsiness. NOTES: Do not share this medication with others. Laboratory and/or medical tests (such as liver function tests) should be performed periodically to check for side effects. Consult your doctor for more details. STORAGE: Store at room temperature away from light, moisture, and heat. Do not store in the bathroom. Keep all medications away from children and pets. Do not flush medications down the toilet or pour them into a drain unless instructed to do so. Properly discard this product when it is expired or no longer needed. Consult your pharmacist or local waste disposal company.